Special business class menu on JL066 from Tokyo Narita to San Diego. Image from Japan Airlines. Japan Airlines (JAL) will launch the first ever non-stop service between San Diego and Asia on December 2 2012 with its state-of-art Boeing 787-8. Initially the service will only be 4 daily roundtrips with flights operating on Mondays, Wednesdays, Fridays and Sundays. To celebrate the launch of this route, JAL has prepared some special menus exclusive for this route between December 2 2012 and February 28 2013. Also JAL announces today that it will be expanding the Tokyo Narita (NRT) - San Diego (SAN) flights into daily service from March 1 2013. Reservations on the extra flights will begin on November 14 2012. 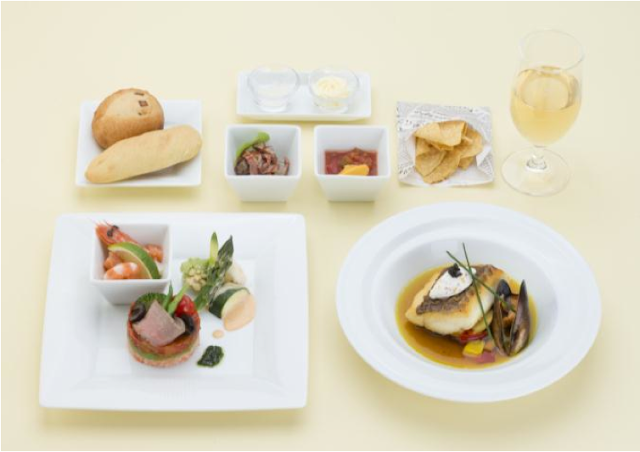 On JL066, JAL has prepared a Mexican themed menus for its business class passengers. Mexican cuisine was chosen because San Diego is famous for its Mexican food given its proximity to Mexico. For amuse bouche, corn tortilla chips will be served with a rich salsa and cheddar cheese dip to all business class passengers. For those who opt for the Western menu, a marinated prawn Ceviche and aspic-glazed roasted lamb with Mexican rice will be served as the appetizer, followed by the choice of fresh sea-bream boiled with saffron and garlic, topped with a flavorful Guindilla cream as one of the entree options. For dessert, all passengers can enjoy the California Orange Chocolate Mousse. On the a la carte menu which business class passengers can order from at any time after the first meal service, JAL has prepared a special Caesar Salad, Mexican seafood burritos and JAL Original Hamburger in Sasebo Style (inspired by San Diego's sister city, Sasebo, in Nagasaki Japan). 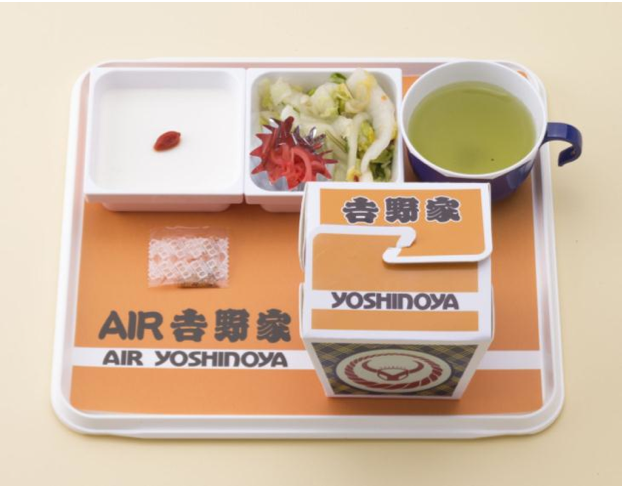 Special economy beef stew will be served on JL066 from Tokyo Narita to San Diego. Image from Japan Airlines. In economy class, a special beef stew will be served with buttered rice and bread, alongside with a bowl of Caesar Salad with creamy dressing and a generous amount of cheese and crunchy croutons. The beef stew is braised over long hours so it will be soft and creamy. On the flight from San Diego, JAL will treat the business class passengers with something it usually only served in first class - the Reconstructed US Prime Beef Wellington. If you watch Gordon Ramsay's Hell's Kitchen, you should be familiar with this dish and know how difficult to cook this to perfection! Another special entree option is the Lobster Termidor which half of a seared lobster from US Maine will be served. 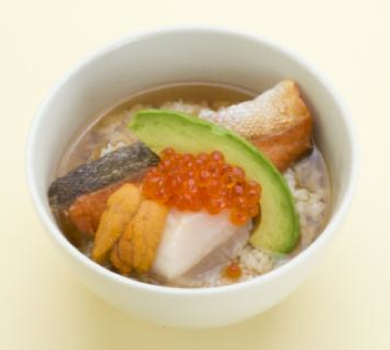 On the a la carte menu, JAL has prepared a comforting bowl of steam rice in Japanese kelp team brimming seafood like salmon, scallops, sea urchin and roe, with avocado. Interesting choice that JAL decides to let the Tokyo kitchen instead of the San Diego kitchen to make the Mexican meals. And let the San Diego kitchen to handle the Yoshinoya. Looks like the idea is to give the passengers a taste of what is it like at their destinations. Hope that's not the same Yoshinoya we can get from around the corner. The cost of a ticket to Japan and one gets that from the airline? Oh, no!